Custom Order Subject to Lead Time. Our Patented Dara Mounted Holster System using RAM Mounts™. Our new Mounted Holsters are 100% made in the USA and securely fastened to the RAM Mount™ diamond plate with 1" poly coated ball, using Melonite and Zinc coated hardened steel hardware. Our rugged Kydex/Boltaron holsters coupled with America's leading mounting structure, makes for the ultimate vehicle self defense and protection system. The RMR Cut Mounted Holster is cut to accommodate the Trijicon RMR Red Dot Sight or like. This holsters comes equipped with an adjustable Military Grade Rubber retention system. The adjustable retention system can be tightened or loosened to the desired holding using a Philips head screwdriver. This system comes with the RAM™ Flat Surface Mount, the diamond 1" poly coated ball base attached to the Dara RMR cut holster and stainless steel mounting hardware. 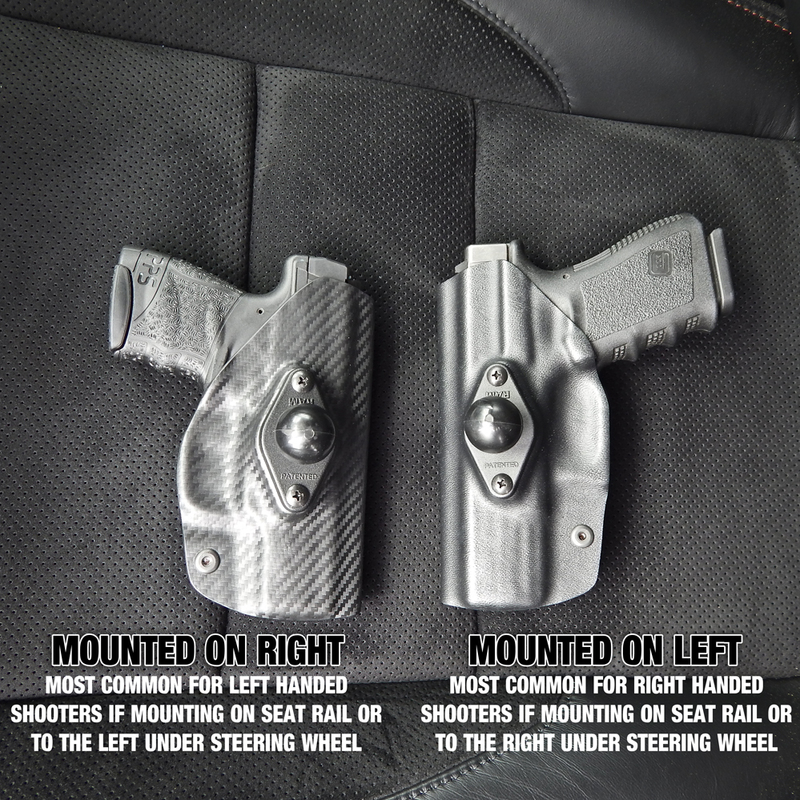 For more information about choosing the Mounting Side of your Vehicle Holster, click here.